Falling stock prices cause panic in some investors, but fluctuations in the market represent business as usual. Investors who are comfortable with this reality know how to respond to falling prices and how to recognize assets that are good buys when stock prices are dropping..
Human nature is to follow the crowd; the stock market is no different. If prices are going up, the kneejerk reaction might be to hurry up and buy before prices get too high. However, this often means that you're rushing to buy a stock for, say, $50 today that you could have purchased for $45 yesterday. When thinking about it that way, that's probably not a good purchase. The opposite also is true. If prices are falling, people often rush to get out before prices fall too far. Again, this might mean that you're selling a stock for $45 that was valued at $50 yesterday. That's no way to make money either. 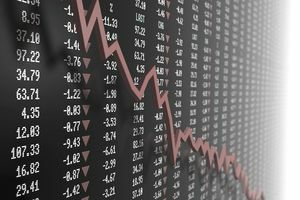 While specific events or circumstances can cause stocks to spike or plummet and investors need to take quick action, the more common reality is that day-to-day fluctuations—even the ones that seem extreme—are just part of longer trends. If you're in the market primarily to build your nest egg, the best course of action almost always is to do nothing and let the long-term growth take place. If you're trying to quickly build the value of your business or your portfolio, though, seeing other people in a rush to sell a falling stock might be your cue to jump in against the current and buy. Consider how that can work for you. Cash dividends and share repurchases. These represent a portion of the underlying profit that management has decided to return to the owners. Growth in the underlying business operations, often facilitated by reinvesting earnings into capital expenditures or infusing debt or equity capital. Revaluation resulting in a change in the multiple Wall Street is willing to pay for every $1 in earnings. Imagine that you are the CEO and controlling shareholder of a community bank called Phantom Financial Group (PFG). You generate profits of $5 million per year, and the business is divided into 1.25 million shares of stock outstanding, entitling each of those shares to $4 of that profit ($5 million divided by 1.25 million shares = $4 earnings per share). If the stock price for PFG is $60 per share, that results in a price-to-earnings ratio of 15. That is, for every $1 in profit, investors seem to be willing to pay $15 ($60 / $4 = 15 p/e ratio). The inverse, known as the earnings yield, is 6.67 percent (take 1 and divide it by the p/e ratio of 15 = 6.67). In practical terms, you would earn 6.67 percent on your money before paying taxes on any dividends that you’d receive even if the business never grew. Whether that return is attractive depends on the interest rate of a U.S. Treasury bond, which is considered the “risk-free” rate. If the 30-year Treasury yields 6 percent, you'd be earning only 0.67 percent more income for a stock that has lots of risks versus a bond with virtually none. However, PFG management is probably going to wake up every day and show up to the office to figure out how to grow profits. That $5 million in net income that your company generates each year might be used to expand operations by building new branches, purchasing rival banks, hiring more tellers to improve customer service, or running advertising on television. If $2 million is reinvested in the business, that could raise profits by $400,000 so that next year, they would come in at $5.4 million—a growth rate of 8 percent for the company as a whole. Another $1.5 million paid out as cash dividends would amount to $1.50 per share. So, if you owned 100 shares, for instance, you would receive $150 in the mail. The remaining $1.5 million could be used to repurchase stock. Remember that there are 1.25 million shares of stock outstanding. If management goes to a specialty brokerage firm, buys back 25,000 shares of their own stock at $60 per share, and destroys it, the result is that now there are only 1.225 million shares of common stock outstanding. In other words, each remaining share now represents roughly 2 percent more ownership in the business than it did previously. So, next year, when profits are $5.4 million, they will only be divided up among 1.225 million shares making each one entitled to $4.41 in profit, an increase on a per share level of 10.25 percent. In other words, the actual profit for the owners on a per share basis grew faster than the company’s profits as a whole because they are being split up among fewer investors. If you had used your $1.50 per share in cash dividends to buy more stock, you could have theoretically increased your total share ownership position by around 2 percent if you did it through a low-cost dividend reinvestment program or a broker that didn’t charge for the service. That, combined with the 10.25 percent increase in earnings per share, would result in 12.25 percent growth annually on that underlying investment. When viewed next to a 6 percent Treasury yield, it's a fantastic bargain. The reinvested dividends will buy more stock, increasing the percentage of the company you own. Also, the money for share repurchases will buy more stock, resulting in fewer shares outstanding. In other words, the further the stock price falls, the more ownership you can acquire through reinvested dividends and share repurchases. You can use additional funds from the business, job, salary, wages, or other cash generators to buy more stock. If you truly are concerned with the long-term outlook, the short-term losses are less significant. It’s possible that if the company gets too undervalued, a buyer might make a bid for the company and attempt to take it over, sometimes at a price lower than your original purchase price per share. In other words, you were absolutely correct, but you got pushed out of the picture by a larger investor. If your personal balance sheet isn’t secure, you might need to come up with money and be forced to sell at massive losses because you don’t have funds anywhere else. It is why you shouldn’t invest in the market any money that could be needed in the next few years. People overestimate their own skills, talent, and temperament. You might not pick a great company because you don’t have the necessary accounting skills or knowledge of an industry to know which firms are attractive relative to their discounted future cash flows.